Our brother and son, Mahmoud Sarsak, is a 25 years old professional footballer from Rafah refugee camp in the Gaza Strip, today entering his 67th day of hunger strike. We ask you to support Mahmoud and his demand for fair treatment. Your voice can contribute to saving his life and to a little victory against injustice. Mahmoud has been imprisoned by Israel for the past three years, after being arrested by the Israeli military on 22nd July 2009 at the Erez checkpoint in Gaza while on his way to join the Palestine National Football team for a match in Balata refugee camp in the West Bank. After his arrest he was transferred to Ashkelon prison where he was interrogated for 30 days, before being given a detention order on 23rd August 2009 under Israel’s “Unlawful Combatants Law”. Addameer, the Prisoners’ Support and Human Rights group, state that “in practice, the Unlawful Combatants Law contains fewer protections for detainees than even the few that are granted under administrative detention orders in the West Bank”, and allows the Israeli state to hold Palestinians from Gaza for indefinite periods without charge or trial. 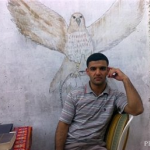 Mahmoud started a hunger strike on 19th March 2012 to protest being held without charge or trial, demanding to be informed of the reasons for his three year detention and to be allowed to defend himself, as is his most basic right under international law. After starting his hunger strike he was transferred to Naqab prison on 8th April and then moved to solitary confinement at Eshel prison. On 16th April he was transferred to Ramleh prison hospital as a result of his deteriorating health. He is now on his 67 day of hunger strike, an extremely dangerous milestone that could see his death at any moment. He is one of over 4400 Palestinians held in Israeli jails in violation of Articles 49 and 76 of the Fourth Geneva Convention, which forbids the transfer of occupied peoples (Palestinians), to the territory of the occupier (Israel). Grave breaches of these Articles are considered war crimes in international law. For us it is unbearable to see Israel has been awarded the hosting of the UEFA Under 21s football championship in 2013 and gears up to participate in the London Olympics, while it routinely arrests, tortures, imprisons and kills Palestinians, including football players, without consequence. This is not fair play. Sports should show solidarity. As Mahmoud’s family, we call on all people of conscience to demand his immediate release, and to pressure governments and international organisations to force Israel’s compliance with the most basic standards of international law. In particular we ask fellow football players and athletes to speak out in support of Mahmoud – don’t be silent when Israeli cruelty and arbitrariness has destroyed the aspirations of a rising athlete and keeps thousands under inhumane conditions in their jails. We ask sports teams and anti-racist fan clubs to organize in support of Mahmoud and all the other Palestinian political prisoners. Your voice can contribute to saving his life and to a little victory against injustice. It is time to end Israeli crimes carried out with impunity, and to demand the release of all Palestinians held illegally by Israel, including the other Palestinian prisoners who, along with our beloved Mahmoud, are hunger striking for their dignity and freedom.